Personalized Chapstick Holders -Leashes (Sleeves) Custom Printed or Clear. Promotional, Inexpensive. Lowest prices in America. Made in the USA. We supply wholesale personalized chapstick holders (also known as chapstick leashes or sleeves) at the lowest prices in the USA and Canada. We also supply blank (not personalized) chapstick holders: see the Price List below. The chapstick holder is hand sewn from high quality neoprene and come in a variety of colors (see picture). The chapstick holder is equipped with a sturdy hook that can be attached to many items. Prices in the Price Table below are for chapstick holders only (without the chapstick). Free artwork design. We will send you a proof for your approval before production. American clients pay no taxes. We also supply all clear (transparent) Chapstick holders, Item # CLIP, for only $0.50 each (minimum quantity: 250).They are blank (not custom imprinted), but they allow the chapstick to show through. They are made of hard clear plastic. Imprint Area 1.9" x 1.25"
Colors: Light Blue, Royal Blue, Navy Blue, Purple, Light Purple, Aqua Blue, Forest Green, Black, Maroon Red, Red, Pink, Yellow, Neon Green, Tan, Cream, Gray. Packaging: 500 per box of 15 lbs, 14"x10"x11". wholesale chapstick holders with chapsticks inside. Personalized Chapstick Holders Pricing Information. Unit prices below include your 1-color custom imprint., or they are for blank (not personalized) chapstick holders. Setup Charge: $45.00 per color. Add $0.25 per unit for each extra imprint color. 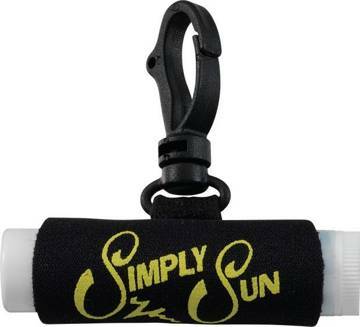 OPTION: Black Lanyard (Neck Rope): add $0.20 per chapstick holder. Production Time: Standard 7-10 Day after art approval; Add 10% to the Unit Price for 3 Day Production. Blank chapstick holders ship next day. We also supply all clear (transparent) Chapstick Holders, Item # CLIP, for only $0.50 each (minimum quantity: 250).